Sea turtles have inhabited our planet for approximately 110 million years, in that time have proven to be a sustainable factor to the marine ecosystems. A remarkable species, humans flock annually in their millions from around the world to witness the females of seven species lay and hatch their eggs on the beaches of Costa Rica, Australia, India and Oman. Nearly all of the seven species of sea turtle are classified as endangered, in most due to plastic pollution, entanglement and the destruction of their nesting areas. Here is a factual analysis of the most enthralling species of sea turtle. The largest of all turtle species, the leatherback is named for its supple and leathery shell. In fact, the only species to not possess a hard shell, the leatherback can weigh up to 1,500 pounds and measure as large as 63 inches from beak to tail. Not only is it the largest species, the leatherback also dives the deepest and travels the furthest, one individual was recorded to undertake a round-trip of more than 12,000 miles. While populations have declined in their Pacific and Asian nesting locations, areas such as Costa Rica, Mexico, India and Sri Lanka, the Atlantic population’s in Florida is calculated to be on the rise. While very little is known about the turtles’ lifespan, estimates have stated that they can live to as long as 30 – 50 years. Their average clutch size averages at 110 eggs, 85% of which are viable to hatch. One of the leatherbacks favourite nutriments is jellyfish species, and in this contemporary world floating plastic that looks akin to jellyfish have caused many individual deaths. The leatherback sea turtle is classified as vulnerable. The only species to be classified as critically endangered, the hawksbill sea turtle is renowned for its splendid shell that often change colour depending on sea temperature. This firework-style shell is often taken by poachers and sold on the black market. Hawksbill’s are known to live in tropical and temperate waters across the globe and their sharp, curving beak is used to rip sponges and anemones off reefs before consumption. Nests of the hawksbill usually contain 140 eggs and their lifespan is thought to range between 30 and 50 years. Marine biologists have estimated that loggerhead turtles can live up to 70 years, making them one of the longest living of all the sea turtle species. With an average clutch sizes of 112 eggs, the loggerheads’ population is plentiful in the Asiatic region as well as the Caribbean. Although classified as vulnerable, the Loggerhead is believed to be the second most common and widespread of all the species after the olive ridley sea turtle. The second largest of the species, the loggerhead tend to feed like the others on sponges, jellyfish and even the deadly Portuguese Men O’ War. Every year the beaches of Tortuguero in Costa Rica are littered with Green turtles as they lay and subsequently hatch before returning to the Caribbean Sea. Endangered, the Green sea turtle population is closely monitored by research facilities around the world. 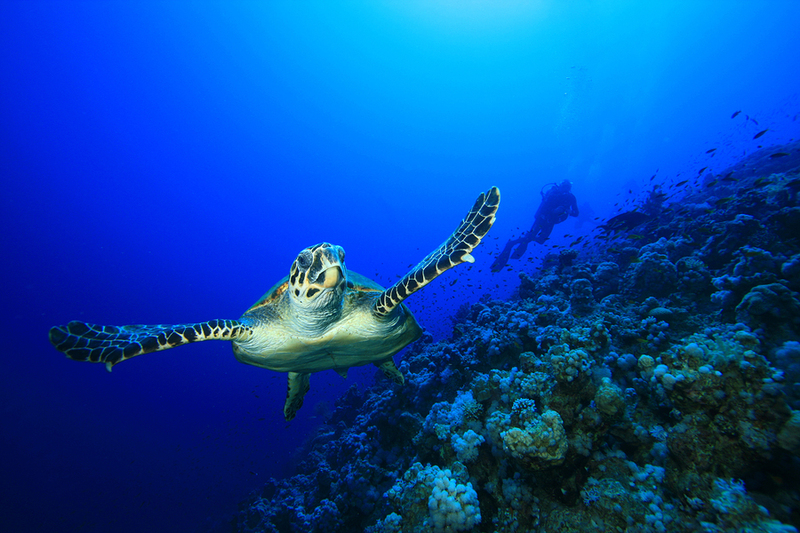 Reaching 4 feet and weighing up to 420 pounds the green turtle eats mostly sea grass and algae. In Australia green sea turtles are a favourite prey of Tiger sharks. Green’s usually produce 115 eggs in each nest. Greens can live for up to 80 years. The smallest (average 2 feet) and most common of all the sea turtle species, the Olive Ridley while classified as vulnerable are known to nest in huge numbers along the Costa Rican, Central African and Australasian coasts. In 1991 600,000 individual females nested on a single beach in India. With an average clutch size of 116 it can be assumed that if poaching and plastics become a less threatening issue, Olive Ridley’s can grow substantially in population especially as they can live to 50 years old. Kemps Ridley and Flatback sea turtles make up the remainder of the sea turtle species.